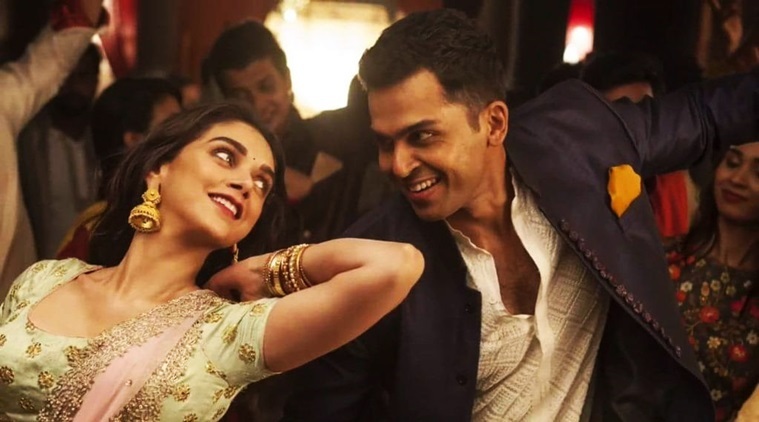 Kaatru Veliyidai is a typical Mani Ratnam romantic drama with aesthetic visuals, meritorious music, classy characters and a feel-good romance but sadly, the director fails to score as a captivating storyteller. Everything we witness in the film is a rehashed version from previous Mani Ratnam films! Just imagine Inba(Madhavan) and Sashi (Meera Jasmin) from Aayutha Ezhuthu, now make the professions of both the characters more sophisticated, we get the stylish fighter pilot Varun Chakrabani aka VC(Karthi) and an independent doctor Leela Abraham (Aditi Rao Hydari). If Inba disrespects Sashi, she would express her anger, she can't speak feminism but our Leela can. Talking about Varun, other than his modern look, he only shares same characteristics as Inba. Leaving aside Ravi Varman's scintillating visuals capturing scenic locales and kingly orchestration of AR Rahman, the film's biggest strength is Aditi Rao Hydari, she owns the film with her winsome performance. The way Aditi cries, laughs and emotes completely attract us that when we leave the movie hall, she refuses to move away from our heart. However, the rest of the characters fail to create such impact. Though Karthi looks smart and fresh, he couldn't justify the young and energetic VC. There is a natural swag in Karthi but when it comes to intense romance, he still has a long way to go. Mani Ratnam's films are known for inimitable writing without any compromise but here everything looks so convenient and filled with plenty of logical loopholes. Especially, scenes where Karthi escaping from Pakistan Army looks so silly and contrived. To be precise, Kaatru Veliyidai is an exotic trip but the overall experience is not so exciting, we couldn't carry any memorable moments back home! Verdict: An exotic trip but the overall experience is unexciting!